Fully renovated Medieval water mill, fishing for trout from the terrace. Home with three bedrooms, two bathrooms and view on cascades and Roman bridge. The gite (officially classified as a 4 star accommodation) is part of a water mill of which one part is inhabited by the owner while another part (the part that is located on the bank of the river) is set up as an independent gite. 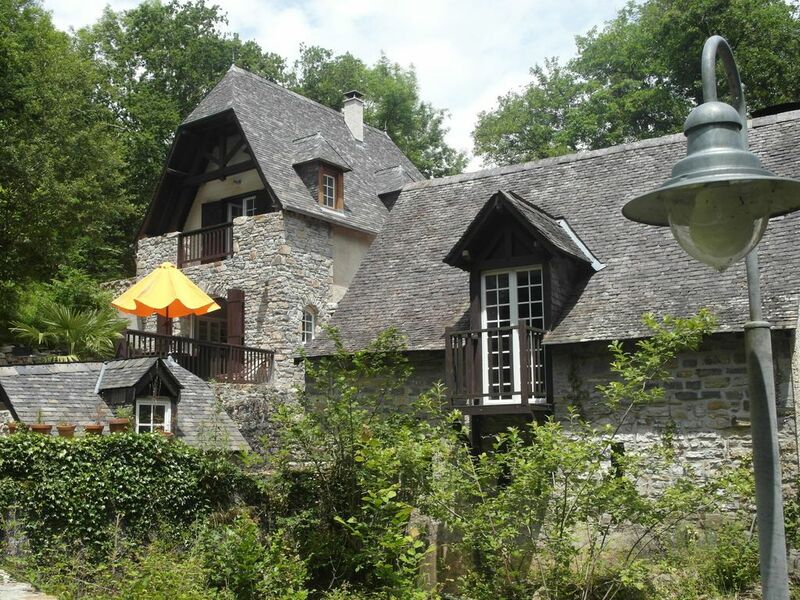 The gite has a private entrance and a number of terraces with total privacy. The house is situated on a 8 acre wooded and hilly estate. Your car can be parked on the other side of the river from where a bridge gives you access to the house. There is also a balcony overhanging the water with a dining table. There is also a fenced terraces so that small children are not able to reach the river. A small branch of the river runs under the house. The water flow can be regulated via a lock further upstream. The gite has a spacious kitchen with all the amenities of a normal house: stove, oven, dishwasher, washing machine, dryer, toaster, coffee maker (Nespresso and also a regular Melitafilter device), iron and ironing board. The sitting room has a 3-seater sofa, a two-seater sofa and an armchair. There is satellite TV with access to the Dutch Canaaldigitaal ' Entertainment package ' and a WiFi internet connection throughout the house. Bedroom # 1 has an en-suite bathroom with toilet, bathtub and separate shower. This bedroom has panoramic views of the beautiful old bridge and the cascading waterfall. The murmur of the river can be shut out entirely by shutters and double glazing, if you wish. You can also sleep with the windows open and enjoy the sound of the running water. You don't have to be afraid for mosquitoes because there are none. The only thing that might bother you is the ticking against the window of the yellow wagtail or the rare white-throated dipper. Bedroom # 2 has a view of the 'courtyard' where the sound of the river is not noticeable. This bedroom is directly connected to the small kids room (# 3) with bunk bed (see picture). Also bedroom # 2 has an en-suite bathroom with toilet and shower. All beds are equipped with high-quality queen size mattresses and down duvets. Sometimes, if it has not rained for weeks, the river can dwindle to a quiet rippling stream where one can wade through or place a deck chair in in the water. However, there are always deeper parts where one could swim if the cold mountain water is not an effective deterrent. After a heavy rain the river can swell to a ferocious torrent. Every now and then you can see fishermen walking in the river. Our village is a 5-minute drive from the larger town Oloron Sainte-Marie where one can find all tyhe known French supermarkets as well as the little butchershopss, the many bakeries, fish and vegetable shops. Friday morning is market day. Chris is born and raised in The Hague, Netherlands. He studied geology (PhD) at Leyden University in the Netherlands and had a career with Shell until his retirement some years ago. He lived in many countries but decided that France would be the best place to live permanently. Chris is married to Anna, a French/Greek/Australian woman. Together they have a son called Alec. He is six years old and attends a French school. He is fully bilingual since we speak English at home. Soon he will be trilingual since he attends a bilingual (Spanish/French) school. Spanish is important since Eysus is only half an hour drive from th Spanish border. We first lived in the Provence for a number of years. However, after we discovered the Pyrenees with its beautiful lush nature and, importantly, the lack of wind (we grew tired of the dry landscape and the mistral in the Provence) it was not difficult to make the switch, especially after we found the water mill in the most idyllic location on the planet. We renovated the water mill for the last 7 years because it was hardly livable when we bought it. With a surface area of some 2200 ft2 is was a bit too big for the three of us. So we decided to share this beautiful place with other people and the idea of a gite was born. Words are inadequate to describe this place. You will understand after you have seen the photos on this listing. Bathrooms #1 and #2 are en-suite with bedrooms #1 and #2, respectively. On the other side of the river. One has to cross the river via the private bridge to reach the gite. Three seater sofa, two seater sofa and an arm chair. BBC World, CNN, Discovery Channel, National, Geographic etc. Hundreds of CDs from classical to popular. Hundreds of films and a number of BBC series like Yes Minister, Yes Prime Minister, Pride and Prejudice etc. etc. Have rented in southern Europe for years.This was by far the most beautiful, comfortable and magical place we have ever stayed in. We are very pleased that you have enjoyed your stay and we appreciate your positive review. Thank you very much. Our stay at the moulin was fantastic! It was the perfect central location to explore the Pyrenees and Basque areas. We enjoyed walking around Eysus and frequent trips into Oloron. Everything in the house worked perfectly. The stream provided many hours of enjoyment. We hope to be able to return soon. Thank you for sharing your home with us. Most amazing property I have ever rented. The mill is beautiful and in a lovely rural area. Very well maintained and well equipped. The owners were gracious, helpful and made us feel like guests. We wanted a comfortable base in the Pyrenees so my husband could do some nice road cycling outings and we could both enjoy sightseeing and French culture: this holiday home proved to be perfect for this. Eysus itself is a tiny village, with quiet country lanes going off into the hills- great for cycling. The nearby town of Oloron Ste Marie is very attractive - plenty of history, scenery, architecture, cafes, restaurants and shops - and is an easy 15 minute drive away. The holiday home itself is beautifully appointed. Downstairs is the lounge, kitchen and dining area. French doors from the dining area take you out onto a balcony with table and chairs overlooking the river. Also from the dining area, a few steps up and through a door is a spacious double bedroom with ensuite bathroom, plus a bunk room suitable for children. We only used the second double bedroom, which is upstairs above the lounge. It too has an ensuite bathroom and small walk-in wardrobe. We loved the quirky character of the watermill and its beautiful setting. The hosts were welcoming and friendly - despite our very late arrival time - and we really appreciated the breakfast of fresh bread, croissants and coffee they brought round on our first morning. We really enjoyed our stay. Chris and Anna are incredible hosts and they went out of their way to make our stay as comfy and pleasant as possible. Their place is incredible and the pictures are absolute accurate. The location is a great base to explore the surrounding villages and valleys. Thanks again for a wonderful stay! Highly recommended.! Thank you for your kind words. It was lovely meeting you. What a way to explore the Pyrenees from this place. The setting was great and the facilities were also good. But you cannot go past the setting of this accommodation. It was very comfortable for 2 couples with plenty of space for everyone to have their own space and not on top of each other. Would befinetly recommend this place. Hosts were very helpful in things to do around the area. We are glad that you appreciated the house.